Ofcom has today announced a new initiative to make it easier for communications customers to get better deals. We want more people to shop around with confidence and take full advantage of the wide choice of competitive phone, broadband and pay-TV services on offer. This means helping people identify and secure the best deals for their needs and budgets – whether by agreeing a new deal with their current provider, or finding an alternative one with a different provider. Ofcom research shows that the proportion of ‘engaged’ consumers – those who have actively switched, shopped around, or negotiated in the last two years – varies significantly across communication markets. 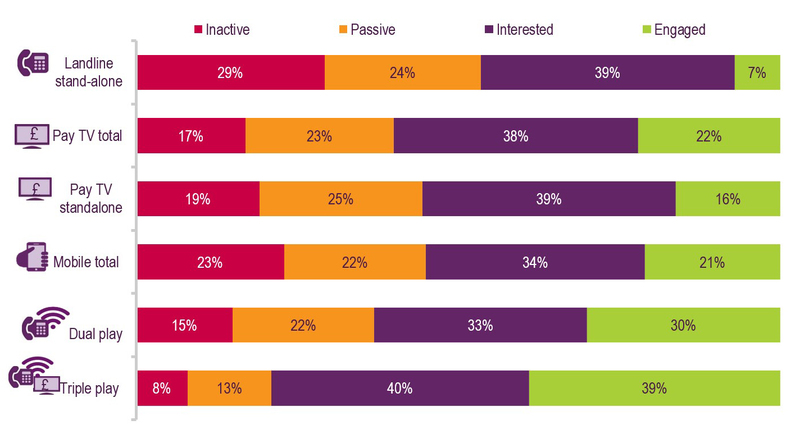 This chart shows how engaged consumers are, based on four categories, across different services.1 For example, just 7% of consumers taking landline telephone services on their own are ‘engaged’, compared to 39% for people that bundle landline, broadband and pay-TV services together. Today’s call for inputs explores how to help less-engaged customers to access the most cost-effective deals for their needs. It complements other Ofcom initiatives to protect more vulnerable people who are less likely to switch – including plans announced earlier this year to cut monthly bills by at least £5 a month for BT customers that have only a landline. Ofcom has today outlined three potential reasons why some people fail to shop around, and possible measures to address them. 1. Ease of leaving current service or provider: some contract terms may deter people from switching. For example, when people take more than one service from their provider, companies may impose different contract end-dates for each one. This could mean consumers need to pay a charge to exit one of their services early, or delay switching until the later contract ends. Possible action: we are considering whether information about exit terms or contract lengths currently provided to consumers at the start of a contract is sufficiently clear. An alternative solution could be to require that all elements of a bundle have the same contract end-date. We are also assessing whether handset locking practices dissuade or delay people from changing mobile provider. 2. Confusion about when to engage: people may not be fully aware of when to review their existing deal. Many consumers allow contracts to ‘roll over’ after the minimum term expires,2 when they could have saved money by switching or renegotiating their contract. Possible action: we are considering whether consumer engagement could be improved if providers were to prompt customers by informing them that their contract is coming to an end. 3. Uncertainty about services and needs: some people may lack confidence identifying a deal or package that meets their needs. They might be uncertain about their usage requirements, or struggle to understand the range of tariffs available. These customers may end up paying higher prices for deals which exceed their actual needs. Similarly, people who underestimate their use may receive unexpectedly high bills, having exceeded their monthly voice or data allowance. Possible action: we are examining whether pricing information could be presented on a more comparable basis. We are also exploring if consumers should be given details about their current service and personal usage in a standard format, so they can identify and compare offers more effectively. Over the next two months, Ofcom is inviting views from the public, consumer groups and companies on barriers to customers participating in the market, and is planning further consumer research. Having considered the results and wider feedback, we expect to announce any next steps for increasing engagement in Spring next year. We then intend to conduct ‘real-world’ trials of possible measures to test how effective they are in changing people’s behaviour. “We want to help telecoms and TV customers take full advantage of the products and deals out there. Last year, we outlined proposals for a process where customers switching landline, broadband or pay-TV services between different networks might only need to contact the provider they were moving to, who would then coordinate the switch on their behalf. There is already a similar process in place for landline and broadband customers who switch within the Openreach network. Having carefully considered all of the evidence, we have decided that it would not be proportionate and justified to make changes to the process for switching services between Openreach, KCOM, Virgin Media and Sky. We are now focused on addressing the wider problems that consumers face outside the formal switching process, and will aim to remove any barriers preventing customers from getting a better deal.